About three years ago I had an idea. I thought it would be fun to build a new Chemistry elective around the science of food. I floated the idea by some colleagues and students and everyone agreed; a Food Chemistry course could be an interesting and fun class for students looking for an advanced Chemistry course, but who weren’t necessarily interested in going the AP route. Encouraged by the positive responses, I set out to research and collect resources as I played around with how to structure the class content. Working in an Independent School, I am afforded a lot of freedom when designing the classes I teach. This freedom is both invigorating and terrifying. As I began to sketch out what I wanted the class to be I realized I could make this class anything I wanted! I wasn’t tied to any framework or state standards! WAIT!?! THERE IS NO FRAMEWORK OR STATE STANDARDS!?! How will I know what to include? Where will I find activities and assessments? Who will I turn to when I inevitably get in over my head? How will I teach food science without a food-safe lab? When the initial panic wore off, I turned to my tried and true source for teacher collaboration, Twitter. (Want to learn more about using Twitter for collaboration? Check out Lowell Thomson’s article) Of course, I found some brilliant and generous teachers who were willing to share their thoughts with me. Three different teachers from across the country tweeted at me and said they were willing to join in a conversation. We started a google doc and each of us contributed the ideas and resources we had collected over the years. 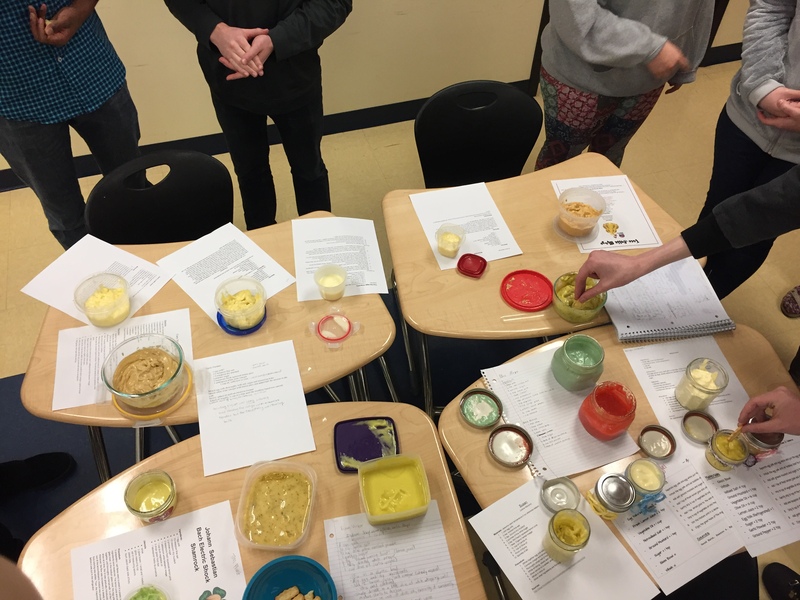 Dana Hsi (@wwndtd), Kathryn Ribay (@kathrynribay), and Jason Olson (@jasonleeolson) graciously compiled the items they had collected, and engaged in thoughtful dialog on the best ways to introduce food science to high school students. The document we created would launch dozens of google searches and lead me down hours of food-themed YouTube rabbit holes. After the google doc collaboration, I searched through the archives of the Journal of Chemical Education and came across two articles describing collegiate Food Chemistry courses designed for non-majors. The articles, “Science of Food and Cooking: A Non-Science Major Course” by Deon T. Miles and Jennifer K. Bachman and “Design of a Food-Chemistry Themed Course for Nonscience Majors” by Patrice Bell helped me piece together the framework that would become my class. I also attended two Food Chemistry Mini-Workshops at the Biennial Conference on Chemical Education (BCCE) in 2014 and 2016. (These workshops were organized by Elizabeth Pollock from Stockton College, Subha Das from Carnegie-Mellon University, and Sunil Malapati from Clark University) The BCCE experience showed me I could teach food science outside of a kitchen lab and I walked away with a new set of activities for my class. Instead of a traditional textbook, I have been pulling additional ideas and activities from three books I had on my shelf. What Einstein Told His Cook by Robert Wolke, What Einstein Told his Cook 2 by Robert Wolke and Marlene Parrish, and On Food and Cooking by Harold McGhee. I am also using YouTube videos from ACS Reactions and SciShow, as well as episodes of Good Eats with Alton Brown. After playing around with different formats, I decided to structure the course around food molecules. I plan to include four main units: Water, Lipids, Carbohydrates, and Proteins. Learning Goal(s) C.1.1 Properties of Water - Describe the properties of water and implications to food science. I can qualitatively and quantitatively describe the properties of water such as polarity, solubility, vapor pressure, boiling point, and freezing point. I can quantitatively describe concentration of solutions. I can differentiate between solutions, colloids, suspensions, and emulsions - and discuss their applications to food science. I began the class by reviewing the properties of the water molecule, namely polarity. I used the SciShow video, Does Water Go Stale Overnight? to engage the class in a discussion about tap water. We then discussed factors affecting solubility and colligative properties. My students practiced doing concentration calculations and conceptually explaining the process of solvation. I challenged them answer the question, “Does water boil at the same temperature in the microwave as it does on the stovetop?” They had to design an investigation to answer the question and collect data at home, then report back to the class. To finish out the first week I found a recipe for rock candy for the students to try over the weekend. The following week we began a study of caffeine. I showed ACS Reactions videos, Caffeine: The World’s Most Popular Drug and Why Does Coffee Make you Poop? followed by SciShow’s Caffeine! The students then conducted a solvent extraction of caffeine in the laboratory. In the lab activity students learned a new procedure, solvent extraction, and were able to apply what they had learned about solubility from the previous week. In the final week of the unit, we discussed emulsions, suspensions, and colloids. I introduced the terms in a brief lecture and then had the students break into small groups to practice making a foam and an emulsion. I gave each group an egg, a bowl, and a whisk. We used three types of bowls, stainless steel, plastic, and glass. The first challenge was separating the yolk from the white. Once each group had an egg white, they set aside the yolk and started whisking. I came around and added a different substance to each bowl. Students experimented with the effects of vinegar, tartaric acid, citric acid, baking powder, and lemon juice. They compared their results with the other groups. We discussed how the material the bowl was made of affected the foam and how the different add-ins changed the consistency of the egg white. We then moved on to the egg yolk and attempted to make an emulsion. They began whisking and added a small amount of vinegar. Some groups were instructed to add a cup of vegetable oil all at once, and some were told to drizzle it in. The results were distinctly different. The students then started offering ideas on why some foams worked better than others and why some emulsions failed, when others were successful. The next day we watched Season 1 Episode 10 of Good Eats entitled "The Mayo Clinic" and Alton Brown explained the science behind a successful mayonnaise emulsion. 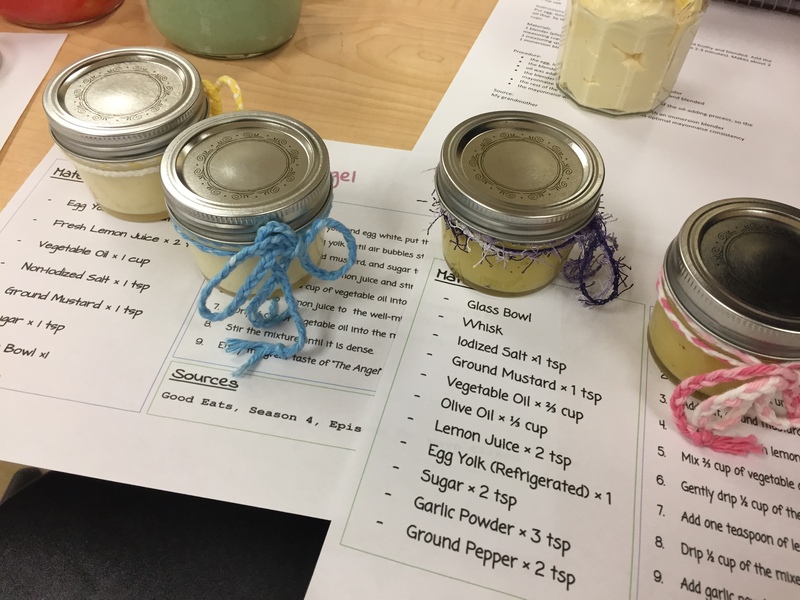 The students were challenged to make a mayonnaise at home, and include at least one “add-in” they thought would enhance the flavor. They wrote lab reports including their materials and procedure. This was super fun to read. If I ever get to teach this elective again, I am totally re-organizing and trying some of this out. PS- My students love the "Why does coffee make you poop video?" too. I am in the first day of planning a new Food Chemistry Elective course for the coming school year. I have a number of ideas and resources but would really love to build off of the idea of those that have tried things already. I will hopefully be teaching the same elective three times throughout the school year - roughly 12 weeks each. If you're willing to share resources, I'd be super appreciative!! Erica might have more to share, but I want to point out that Tracy Schloemer has shared ideas about food chemistry as well https://www.chemedx.org/blog/developing-cooking-chemistry-elective. I'm happy to share some resources with you. Have you thought about how you're going to structure your course? Do you have learning goals outlined yet? I have been requested to teach a one year high school food chemistry course. I am struggling to find a curriculum for the whole year and additional resources. Would you be able to direct me? I would be happy to share resources I used. My course was only a semester long and was a biochemistry course I decided to frame using applicaitons in food science. Hi Erica, your article was very interesting. Would love to hear more. I've been asked to put together a "Biochemistry of Foods" course for the next school year. If you'd be willing to share your materials and resources I'd greatly appreciate any help you could give. Thanks so much! Hi Gordan! I hope you found Tracy Schloemer's post about teaching food chemistry and her follow up post that includes even more resources. Thanks Deanna for the links these are helpful. However, Erica's class seems to be more closely aligned with what I envision for my class. Erica, is it possible if you could explain or allow me to see what you did for your other 3 units? Thanks! Here are the learning objectives I used for my other units; I'm currently revising my materials because I get to teach this class again this spring! 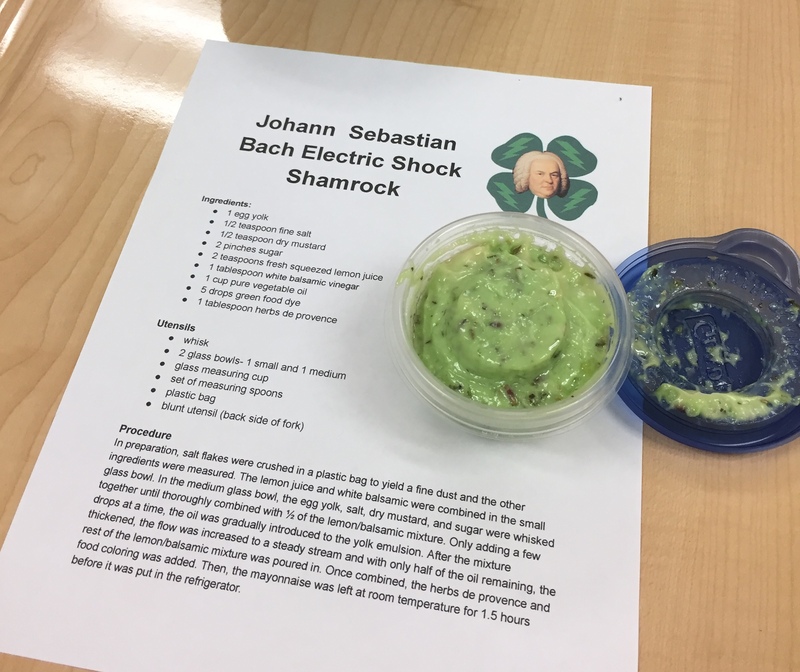 I have culinary electives at my school "restaraunt class" and I have wanted to use my chem class to be an extension for that class to bring some real-world and engagement to the subject. This would all fit in with NGSS very nicely.